Armstrong showcases the Monkey Kit wrapped around two chairs, beginning at about 2:15 into the video. 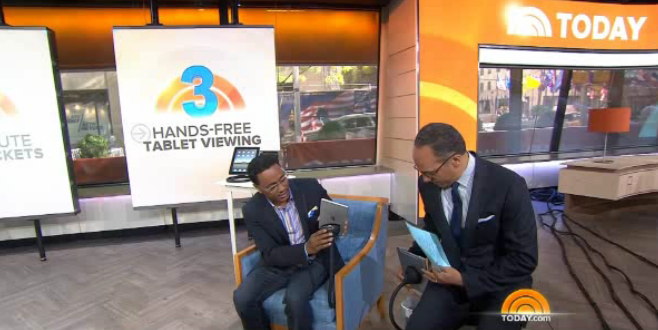 Both he and Lester Holt sit in the chairs to view the “hands-free device” with a table behind them. The table features two Monkey Kits in their table-top positions. Armstrong mentions the industrial-grade suction of the Vacuum Dock and the flexibility of the MonkeyTail. He even notes that he’s seen people wrap it around a ladder to view “how-to” videos while doing home repairs. He recommends the iPad holder for use on exercise machines. Lester makes a joke about how we are getting even more lazy by not holding our tablets anymore, but Mario lets him know it’s great because you can have your hands free to hold a beer while watching a movie on your tablet! Check out the full clip on the TODAY Show online.